The Queen is to break with tradition and observe the annual Remembrance Sunday ceremony from a balcony overlooking the Cenotaph, with the Prince of Wales laying her wreath. 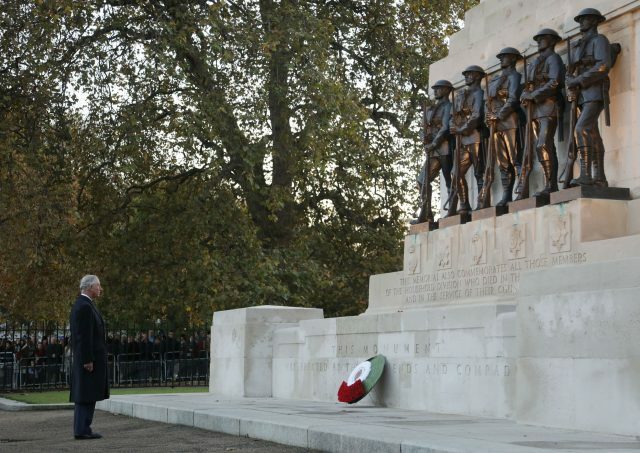 At the Queen's request, Charles will place the floral tribute at the base of the Cenotaph on November 12, and Philip's equerry will lay his wreath, Buckingham Palace has said. A Buckingham Palace spokeswoman added: "The Queen wishes to be alongside the Duke of Edinburgh and he will be in the balcony." Earlier this year, Philip retired from his public duties, but on occasion has joined the Queen at her official engagements. The Queen and Duke will be standing on a balcony of the Foreign and Commonwealth Office traditionally used by royal women like the Duchess of Cambridge and Duchess of Cornwall to watch the Remembrance Sunday service in Whitehall.